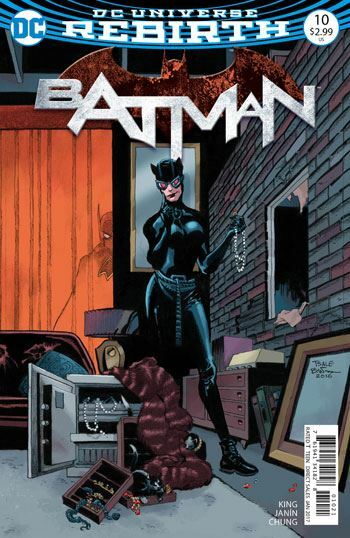 With Batman #10 Tom King displays his skill at crafting a complete single issue story that works perfectly well on its own, and yet is also a vital chapter of the larger storyline that has been going on since the reboot of this book. Batman is in Santa Prisca, the island nation ruled by Bane. He has come to retrieve the Psycho-Pirate, in the hopes of undoing some of Gotham Girl’s trauma. Bane has no interest in turning Psycho-Pirate over to Batman, and instead wants to once again break the Bat and make him his prisoner. The two characters actually spend very little time together during the course of the story. But throughout this issue we follow Batman visually, while listening to Bane justify and explain his actions to the hero. So in a way, this is a bit of brains vs brawn. Batman is forced to exert his body to the limits to survive his attack by Bane, and escape from his death trap cell. Bane is playing the more remote game, trying to break Batman mentally as well as physically. But Bane has underestimated just how much planning Batman does ahead of time. Mikel Janin does a very good job with the art. Santa Prisca looks as deadly from the water as it does from inside the prison, and Batman’s physical exertions are so well drawn you can feel his muscles tighten.